Any UBC student interested in sustainable science can join the membership of GreenChem UBC. If you would like to get involved, send us a message! I am a PhD student in chemistry, working with Dr. Harry Brumer on the characterization of carbohydrate-active enzymes. I am originally from India and have been in Canada since 2012. My interest in Green Chemistry sparked from a few sustainable-chemistry related courses I took during my undergrad and has increased ever since. 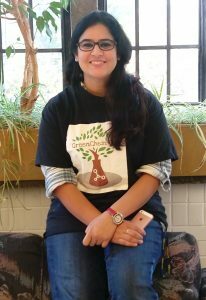 I am passionate about environmentally-safe chemistry and aim to increase awareness about the 12 principles of Green Chemistry further! I am a PhD student in Harry Brumer’s lab in the Michael Smith Laboratories at UBC. I was born and raised in Russia, completed my B.Sc. in Biology from Queen’s University and am now pursuing graduate studies in chemistry. I first heard of Green Chemistry while taking a course from Dr. Jessop during my undergraduate degree. He inspired me to believe that chemistry can be done sustainability and that current chemical processes can be improved. 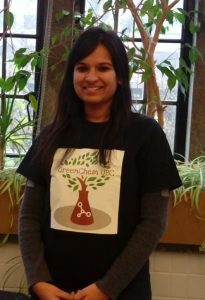 By joining the GCU, I get a chance to contribute to the green chemistry initiative at UBC. 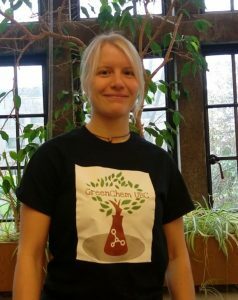 Hi, my name is Amanda Fogh and I am an executive member of GreenChem UBC. I am currently a 2nd-year Chemistry undergraduate student, original from a small town in Ontario named Utopia. 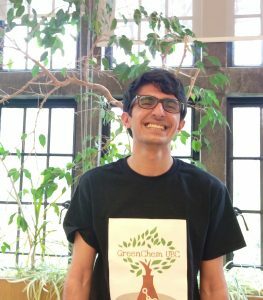 I joined GreenChem UBC because I believe that being environmentally friendly and reducing our impact on the world is important. I also believe that many are not very aware of the negative impact they are creating. This is why I wanted to join this club, to help promote awareness and let people know small things they can do to make a big difference in our world. I am very passionate about Chemistry and belief that although Green Chemistry is relatively new, everyone should try to incorporate it into their practices as much as possible. My name is Mo, and I am a 1st year PhD student working in the Maclachlan group, where I research the self-assembly of Schiff-base macrocycles. I completed my B. Sc. in chemistry at Ryerson University in Toronto. 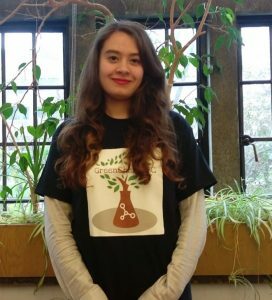 I joined the GCU because the environment and chemistry are two things that are very important to me, and I feel that as chemists we should strive to conduct research in a manner that is as environmentally friendly as possible. By joining the GCU I could help educate others on sustainable chemistry! Hila is a PhD candidate in the Brumer lab at Michael Smith Laboratories, and is passionate about all aspects of sustainable science. She completed her B.Sc. in Molecular Biology from Tel Aviv University before moving to UBC for graduate school. 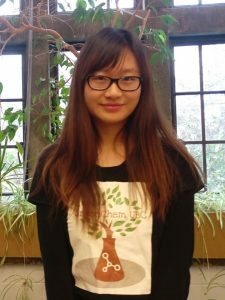 Julie is a graduate student in the department of chemistry in Dr. Chen’s group. Research: Development of catalysis for biodegradable polymers with controlled structure. As a central science, chemistry and its practitioners can make a profound contribution towards mitigating environmental degradation and climate change. Green Chemistry UBC is a fantastic way to raise general awareness around these issues with chemists. 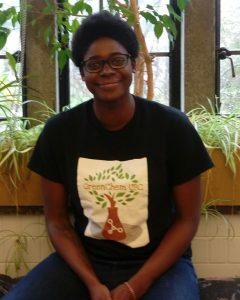 Ese is a fifth year PhD student working with Parisa Mehrkhodavandi where she researches how chemical modifications to biodegradable polymers can increase their application scope. 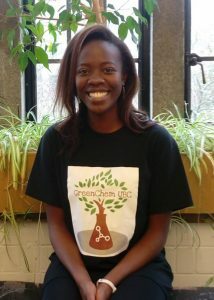 Ese was inspired to form GreenChem UBC in 2016 after seeing the success of the Green Chemistry Initiative student group at the University of Toronto. Ese is passionate about sustainable science and excited to keep engaging in conversations around this topic with the wider chemistry community. 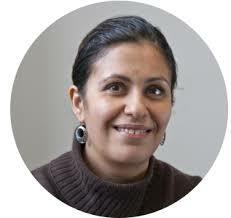 My name is Janet and I am Workshop Coordinator for Green Chemistry UBC. I work on photocatalytic systems and what drives my work and my interest in the GCU is the fact that everyone can play a role in improving the state and the predicted future of our environment. There is no role that is too small! I am a graduate student in Zachary Hudson’s lab working on synthesizing new fluorescent pi-conjugated materials for organic electronic applications. I did my undergraduate degree at Western University in London Ontario, my home town. 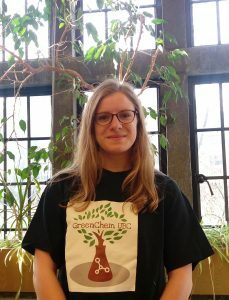 I joined GCU after being introduced to the group at the CSC conference due to my interest in more sustainable chemistry practices and environmental issues. I am a graduate student from the Love Group, working on exploring the reactivity of nickel complexes. 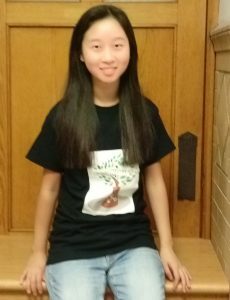 I was born and raised in Shenyang, China, and went to Melbourne, Australia in 2009 where I finished my Grade 12. Then I came to Canada and pursued my undergraduate studies in Environmental Chemistry at Queen’s University. There I worked with Dr. Philip Jessop on the Switchable Solvent project, from which I saw the light of Green Chemistry and determined to further raise the awareness of Green Chemistry. When I’m not doing chemistry, I like to go to YVR Airport and watch those beautiful aircraft (with B777 being my favorite) taking off from Runway 26L. I’m a second-year undergraduate student in Chemistry & Biochemistry, originally from Vancouver, BC. 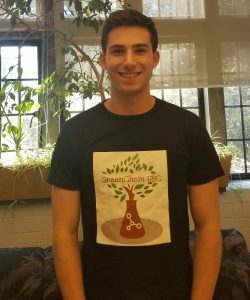 After getting involved with research in catalytic materials, I became interested in how chemistry and the environment are linked, as well as how chemists can incorporate sustainability into their research practices. I’m looking forward to raising awareness of GreenChem’s message through social media—feel free to contact us if you have ideas for new events, or just want to learn more!